“National Child Protection Week encourages everyone to learn about the role they can play in their local community so we can prevent abuse before it starts,” Ms Batty said. Ms Batty recently told Victoria’s Royal Commission into Family Violence that family violence prevention needs to be taught in every Australian school as early as kindergarten, echoing the National Association for Prevention of Child Abuse and Neglect’s (NAPCAN) stance that prevention through education is one of the most effective solutions. Statistics released this year revealed that 40, 844 children were confirmed as having experienced abuse or neglect in Australia last year. The 25th annual National Child Protection Week (September 6 to 12) raises awareness about child abuse and neglect and this year aims to educate Australians about the impacts of family violence and simple ways they can create change in their own community. People are being reminded that protecting children is everyone’s business and that there are many different ways to take part, examples include encouraging children to use their voice to speak up about community issues, being a good role model or advocating for a respectful relationship program to be introduced into your school. 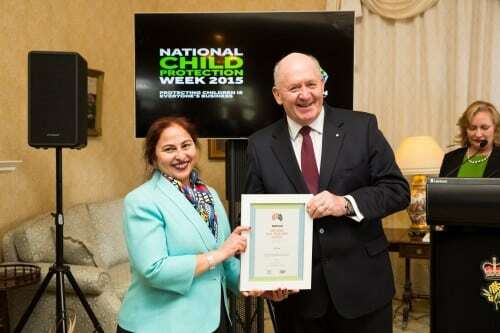 The Governor-General, Sir Peter Cosgrove launched NCPW on Friday by showcasing the National Association for Prevention of Child Abuse and Neglect’s (NAPCAN) Play Your Part Award winners at a special ceremony at Admiralty House. The annual Awards showcase innovative community initiatives and programs focused on the prevention of child abuse and neglect, with all the award winners celebrated during NCPW at events in each State and Territory. This year’s winners include human rights advocate Amrit Versha (pictured above), the collaboration between the National Children’s and Youth Law Centre (NCYLC), University of NSW, King & Wood Mallesons law firm, the Commonwealth Attorney General’s Department, Australian Securities & Investments Commission and Telstra for Lawstuff and Lawmail and the Kids Helpline and Optus’ Kids Helpline @ School program. Along with highlighting the wonderful work being carried out in Australian communities through the Awards, NAPCAN continues to develop practical resources for the public that outline simple, yet effective ways to protect children from harm. They can be found on the NAPCAN website https://www.napcan.org.au.